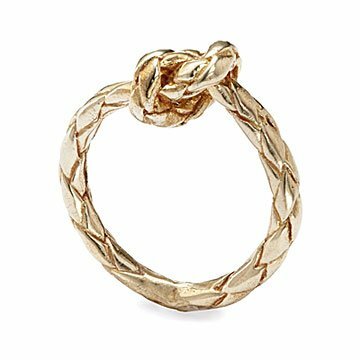 Inspired by the bonds of love, this ring is cast from braided rope tied in a charming knot. Inspired by the bonds of love, this ring is cast from braided rope tied in a charming knot. Amy Shepsman creates the piece from the hand-braided, knotted rope using the lost-wax method in which a precise mold is made using jewelers wax to reproduce the original's subtle detail. She then casts the brilliant ring in shining polished brass. Great for layering with other rings and Love Knot pieces, it offers an upscale look for your own collection, or a heartfelt gift for the one you love. Handmade in New York. Amy Shepsman draws much of her design inspiration from her childhood in Great Neck, New York, where she was surrounded by the unique juxtaposition of nature and the city. Merging the colors and textures of earthy elements with the sleek, sharp architectural shapes of the city, her jewelry line fuses these different worlds to create something wholly unique. Amy combines her years of jewelry bench training with a degree in fine arts from Cornell University. She works alongside artisans who represent the true foundation of quality in design and production to hand-make each of her creations. Clean with soft cloth if necessary, keep in air-tight container when not in use. I wear this ring every day and it holds up well to daily use. I love the simplicity of the design, and it can symbolize love, commitment, someone/something you want to remember.... or it can symbolize your love of nautical design! You might want to order a size up; my ring size is 4.5 and was concerned the smallest size available (size 6) would be too loose, but it fits perfectly.